I remember trying a chocolate Guinness cake in my later years of University when a friend brought one in (we had cake days every Friday). I was a little apprehensive (as I don’t like beer), but once I was convinced to try it, I haven’t looked back. I have been spreading the word, trying to convince as many friends and family as possible (some are more difficult to convince than you would imagine) to try it and that’s all it takes to get most people hooked. It even looks like a poured out Guinness, and you can be sure guys and girls alike will be intrigued by having beer in a cake. The best aspect of this cake has to be how lovely and moist it is. 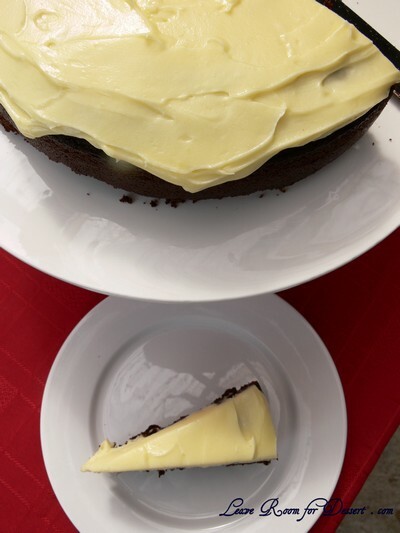 Coming in a close second (or equal first) is the great flavour combination of the chocolate with a very slight Guinness flavour (trust me, I don’t like normal beer, let alone Guinness – but I [and other non-beer-drinkers] really enjoy this cake) and the creamy icing. [By the way, you can freeze it, iced and everything – it makes the perfect easy snack for work, school or shopping]. Heat oven to 180ºC (160ºC fan forced). Butter a 22cm (9-inch) spring-form pan and line with baking paper. In a large saucepan, combine Guinness and butter. 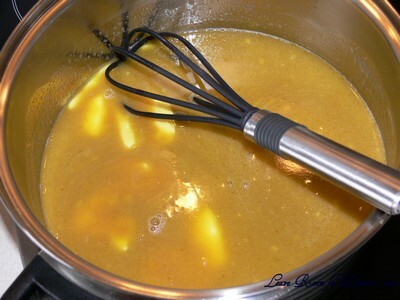 Place over medium-low heat until butter melts, then remove from heat. 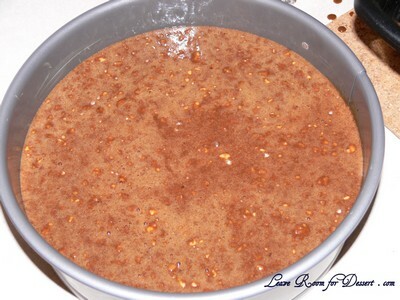 Add cocoa and superfine sugar, and whisk to blend. In a small bowl, combine sour cream, eggs and vanilla; mix well. Add to Guinness mixture. Add flour and baking soda, and whisk again until smooth. Pour into buttered pan, and bake until risen and firm, 45 minutes to one hour. Place pan on a wire rack and cool completely in pan. Yes, it is very liquidy - don't worry - this will make it moist. 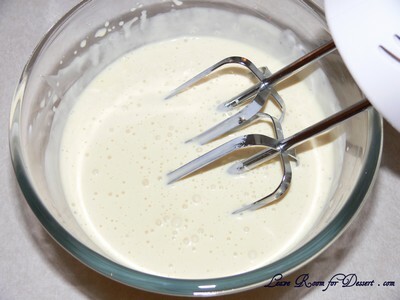 Icing: Mix cream cheese with electric mixer and blend until smooth. Add cream, then sifted icing mixture and mix until smooth and spreadable. 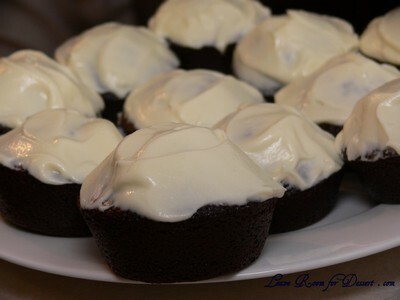 Also add a little cocoa powder to give the icing the murky look of the Guinness frothy if you like. 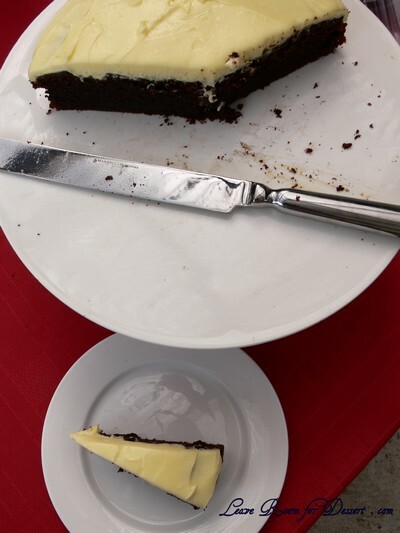 Remove cake from pan and place on a platter or cake stand. Ice top of cake only, so it resembles a frothy pint of Guinness. Makes one 9-inch cake, 12 servings. My Note: To use up a whole 440 ml can of Guinness multiply the recipe by 1.5 times. Pour 2/3 mixture into cake tin and the rest into approximately 24 patty cases or 12 large muffin cases. (cook these for 15-20 minutes). Make 1 quantity of icing as this should cover both the cake and patty cakes. Slices of cake and muffins can be frozen and thawed when you have a craving. 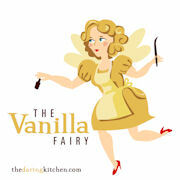 Filed under Cakes, Slices and Biscuits, Chocolate, Dessert, Recipes, Vegetarian. You can follow any responses to this entry through the RSS 2.0 feed. You can leave a response, or trackback from your own site. Wow, what an amazing, delicious looking cake. 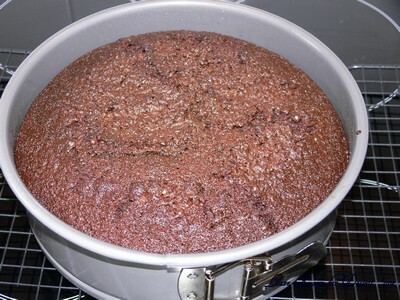 It looks so lovely and moist, it would go really nice with a cup of coffee!! What a great idea making cup cakes/muffins with additional mixture!! You always come up with innovative ideas! 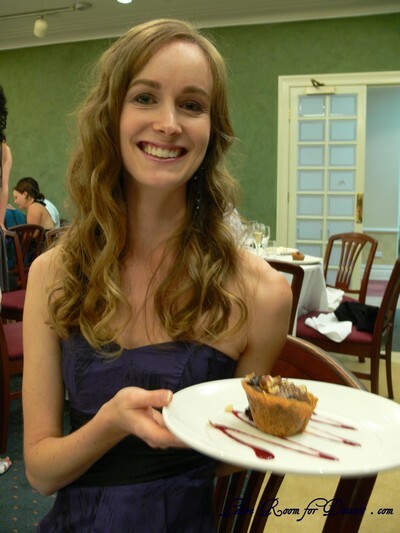 Ahhh, I remember that cake day, and I also remember your chocolate guinness cake. Both get my hearty approval! Beer in cake?!?!?! You’ve won me over just by that combination! It sure does look tasty too! 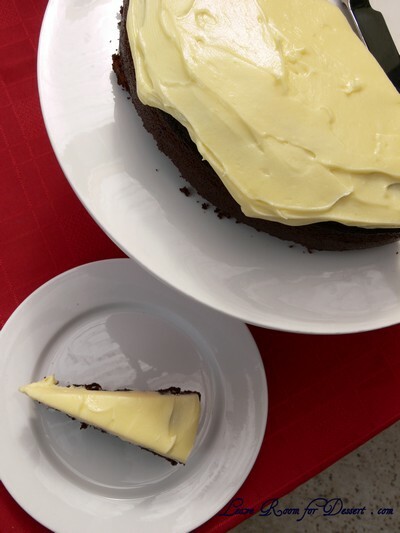 Our Guinness cake recipes are the same… and isn’t it delicious?? Everyone loved it. I changed the cream cheese frosting though. Gammon IS ham, isn’t it? No reason the mustard ring wouldn’t work with it. Anita – you’ve also converted me with this post! The cake looks so moist and the cream cheese topping – yummy! All you need is a beer-glass shaped cupcake mould. Although they might not stand up well. 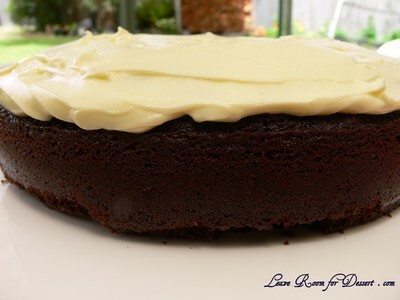 The second chocolate guinness cake I have seen this month……. 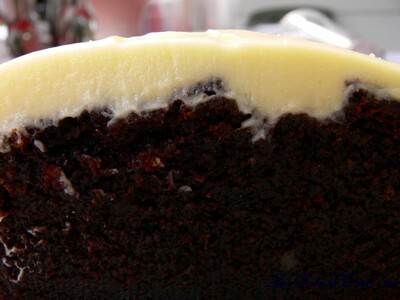 The photos are so intriguing, simply because the icing is so creamy and luscious, topped on a sinful chocolatey cake. Who could resist, right? Here here! This cake is da bomb isn’t it. So lovely and moist and good. I’ve seen some people make a Bailey’s icing which is very creative and good for the St Patrick’s day theme too. I love this! So many chocolate guiness cakes in the past few days! Yumm..this looks delicious! and you make it sound so good too! Will definitely try this…..one day! tehehehe….I wonder what my paren’t reaction will be if I asked them to buy me Guiness?? Ah, the Nigella Lawson classic. This has been part of my family tradition for the past ten years and the number of converts this cake has made is now in the hundreds just from the first tasted baked by a friend’s mum. God bless, Nigella. I have yet to meet anyone who dislikes this one.